(Inglewood, California, October 26, 2017) - Inglewood, California, Minus K Technology, Inc. The vault-like, 40-foot diameter, 40-ton door of NASA's Johnson Space Center’s historic Chamber A sealed shut on July 10, 2017, signaling the beginning of about 100 days of cryogenic testing for NASA’s James Webb Space Telescope (JWST) in Houston. Behind the hulking door, the process to transform the chamber’s interior to match the airless, frigid environment of space began. It took about 10 days to pull the air from the chamber, and then about one month to lower the temperatures of the Webb telescope and its scientific instruments to the levels required for testing. The James Webb Space Telescope is the largest cryogenic instrument telescope to be developed for space flight. The final cryogenic test of the Optical Telescope Element (OTE) and Integrated Science Instrument Module (ISIM) as an assembly (OTE + ISIM= OTIS) will be performed in the largest super-cold vacuum test chamber of its kind in the world, Chamber A at Johnson Space Center. The temperature of the Chamber A will continue to steadily drop until it reaches about 20 kelvins (minus 424 degrees Fahrenheit/minus 253 degrees Celsius), but it will take a little while longer for the Webb telescope and its instruments to reach the same temperatures they will be when operating in space. Needless to say, this ultimate test of OTIS, the cryogenic portion of JWST will be crucial in verifying the end-to-end performance of JWST. 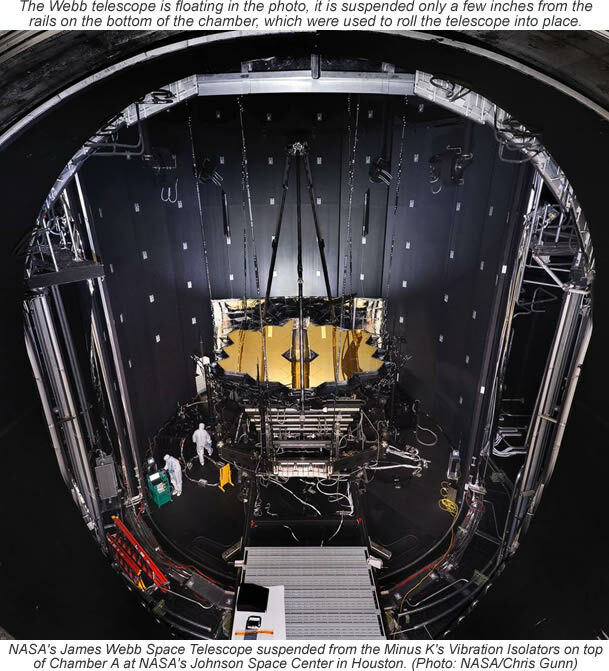 In preparation for the Webb telescope’s cryogenic testing, engineers at Johnson have suspended it from the ceiling of the center’s Chamber A. This "hammock" (really, six support rods attached to Minus K Technology's Negative-Stiffness vibration isolators) is not for relaxation; it’s meant to isolate the telescope from the vibrations Chamber A could produce once the door closes and testing begins, as well as from disturbances that might occur outside the chamber. The telescope needs an arrangement that holds it and its test equipment (an interferometer, auto-collimating flat mirrors, and a system of photogrammetry ‘precision surveying’ cameras already used for tests with a surrogate ‘pathfinder’ telescope) in precise relative alignment inside the chamber while isolated from any sources of vibration, such as the flow of nitrogen and helium inside the shroud plumbing and the rhythmic pulsing of vacuum pumps. With the telescope suspended, engineers conducted a "push test," where they gave it a very slight nudge and observed how it reacted to ensure the suspension system was functioning the best it could, said Matthews. The James Webb Space Telescope is the scientific successor to NASA's Hubble Space Telescope. It will be the most powerful space telescope ever built. Webb is an international project led by NASA with its partners, ESA (European Space Agency) and the Canadian Space Agency.